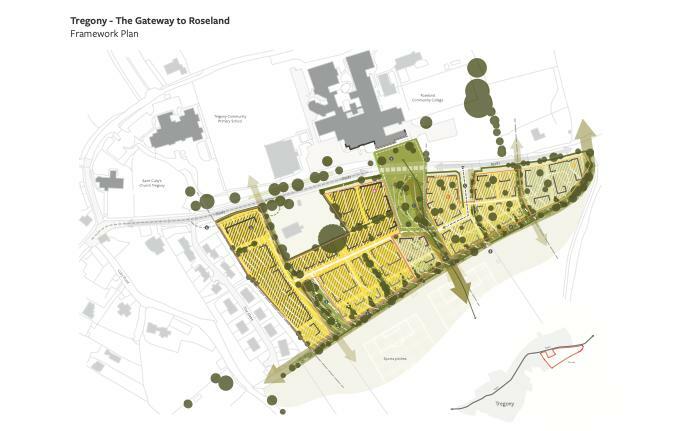 In light of the above assessment the site is not considered to be suitable for open market housing development because the site is not allocated for development; and it would visually extend building into the open countryside resulting in the urbanisation of the landscape that currently makes a valuable contribution towards the rural character of the area and the setting of the settlement. The proposals clearly do not constitute “rounding off” or “infilling” and therefore cannot be supported under policy 3 of the Cornwall Local Plan as you have suggested. Although a small part of the site may have potential as a rural exception site for affordable housing subject to compliance with CLP policy 9, if they are to be supported in principle smaller scale residential development on the site would have to be affordable housing led with no more than 50% of the homes or 50% of the land take for market housing with any market housing being the minimum essential for the successful delivery of the development based on a detailed financial appraisal. However given the currently low level of local need for affordable housing if it were to be supported and found to be acceptable in other respects such a scheme would have comprise of a commensurate and relatively small number of dwellings; potentially less than 20 with access obtained from the west via the adjoining affordable housing scheme at the Glebe. The Local Plan strategy is clear that larger scale schemes such as that which you are proposing should only be brought forward on a plan led basis. It does not support or encourage housing development in surrounding villages to meet the needs of Truro. There are also sufficient sites with planning permission to meet the Local Plan requirement by 2030 and any decision to change the Local Plan strategy to one where the needs of Truro are met through granting permission for housing of the scale and type that you are proposing at Trispen would be a matter for the Local Plan Review. In light of this in my opinion the only scenario under which you might secure support for your proposals is in the long term and either by working with the local community for its allocation as a housing site in an NDP, or by making representations at the appropriate time and successfully securing a revised strategy in the Cornwall Local Plan Review that might support it.